Following our support day in August, we now have a further 10 places available on another Parent’s Support Day being held on Thursday 14th September at our office in Bracknell. Grab the opportunity, as these sessions are very limited! In addition, speakers Suzy Yardley, (Clinical Manager and Deputy CEO) and Mandy Williams (CEO), will be available for a one-to-one chat about any concerns you have or problems you are facing. The sessions will run between 11am – 2pm with one-to-one slots available between 2pm – 4pm. A light lunch will be provided and a contribution of up to £25 can be made to your travel costs for one member of each family attending (on receipt of train tickets or relevant receipts, or confirmation of mileage . 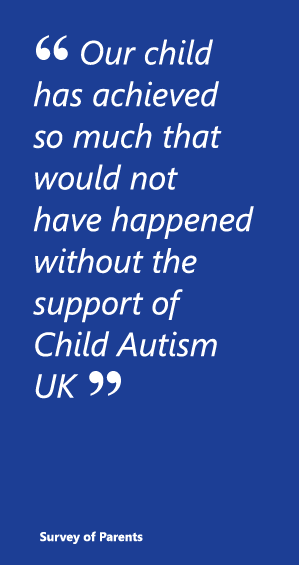 Child Autism UK, Units 3-5 Forest House, Horndean Road, Bracknell, RG12 0XQ. If you would like to attend, click on the link below. We will be in contact as soon as possible. Travel arrangements and further details will be sent on confirmation of place. Please follow link if you are interested and please share with anyone you feel may like to attend.